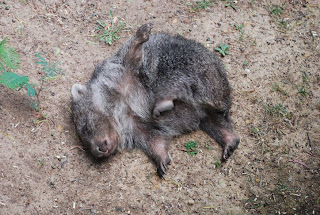 A baby wombat showed off for us. 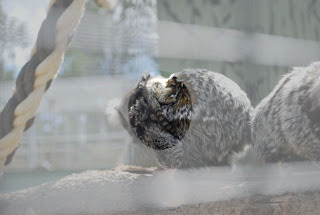 He was really sociable--he was the only baby, and he couldn't be kept in an enclosure with adult wombats, so for companionship they put a rabbit in his enclosure! It was a formula for cuteness, a fat baby wombat chasing a hopping cottontail rabbit around. He was as cute as a baby bear, but infinitely less scary, because he will never grow to ten times my size and want to eat my flesh. He's an herbivore, like me! 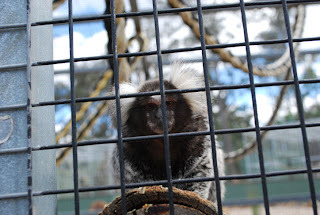 The wildlife sanctuary also had some Marmosets, tiny New World monkeys that are only about 20cm long. They had just had a baby, it's hanging onto its dad's back. and this one was not impressed with me taking so many pictures. 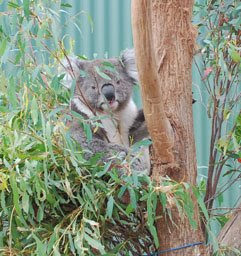 This koala had to be nursing a fierce hangover--they only eat eucalyptus leaves. Eucalyptus leaves are so tough and fibrous, the koala's digestive system can only break down them down through a process of fermentation that creates alcohol. No wonder koalas are so grumpy--they're always drunk. And the devils: they're like adorable marsupial dogs. This one wasn't roaring, just yawning. In fact, we didn't see any devilish behaviour at all. 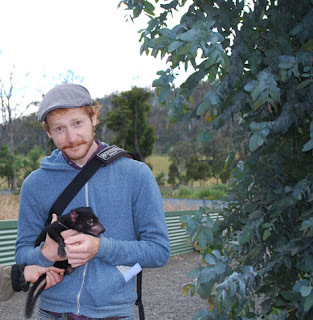 Craig was so happy to cuddle with a baby Tasmanian Devil named Chaos. 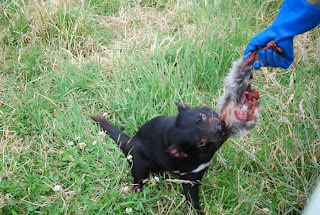 And this adult Devil was very happy to get his lunch of fresh wallaby. Years ago, when I met Paul, I never imagined I would live in a place like this...I hadn't really even given any serious thought to the existence of Australia. It was out there, I knew, but it couldn't matter to me. I was in Melbourne last weekend, and I was nervous. Craig and I were trying to enjoy the city, go to the cool bars (which are infinite in that southerly town of dirty rocknrollers). We went to the Australian Centre for the Moving Image, we tried so hard to amuse ourselves, but... I was nervous. I was about to see Paul, for the first time in five years, an old friend from undergrad. I don't even remember the first time I spoke to Paul, or the first class we had together... or why we spoke in the first place. He was from Australia and he ran a lot; I actually thought the running was weirder than being Aussie. I mean, he was always running. We were both studying politics, and we both had hope for our countries, even when there wasn't much to be proud of on either side of the world. We believed in justice, in the societal benefit a benevolent, democratic government could create. Of course, that makes terrible conversation, so our friendship generally consisted of me making jokes about Outback Steakhouse, and him making jokes about our government. He always won. He went back to Melbourne after graduation, and we tried to stay in touch, though of course we failed. I felt our friendship had a natural ending, and that we probably would have grown apart over time, anyway. It was like a good book you enjoyed and then misplaced. You're not entirely sure where it went, and despite the fond memories, you know you'll never see it again. It's out there, you're sure, but you're not too worried about it. I hadn't spoken to this guy in years, we had only reconnected over email once I learned I was moving here. I had no pictures of him; my memory of his face was a sketch at best, and I'm not a good sketcher. He came to pick us up at our hostel, and asked us to spend the rest of our vacation with him at his family's house in the Mt. Dandenong range. Paul and his family were the most gracious hosts; we stayed with them for three days, and had a lovely lovely time. We stayed up late talking with Paul, and his mom, dad, and sister. Paul took us out hiking and to wine tastings at Yarra Valley vineyards. We had dinners together, and talked about Australian and American politics. He even took us to see the seriously bizarre William Ricketts Sanctuary, where oddly symbolic sculptures of Aboriginals and lyrebirds sit among the ferns of the Sanctuary. 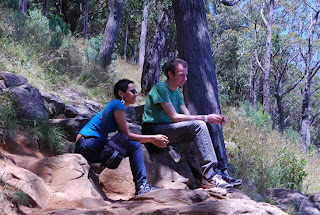 In those few days, Craig and I got to see a beautiful part of the Dandenong ranges, but more than that, we saw the best of Australia's sincere generosity. These people opened their home to us, only knowing that we had been friends with their son years ago. And as it turns out, Paul and I have grown, but not so apart. We still believe in justice, we still have hope, and there is a happily a little more to be proud of on both sides of the world. Americans have only 10 days before the end of an administration and party that instigated war after war, backed by only lies. Australia recently brought a new Prime Minister in, one who had the courage to make an apology to this country's native people, on behalf of the whole government, on behalf of everyone who has benefited from their oppression. It was good to learn that friendship hadn't ended at all; it had just been waiting all these years, for me to come pick it up...like a good book I'd misplaced so long ago--on the other side of the world.